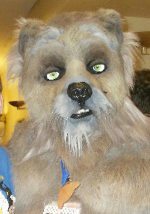 Grubbs Grizzly's advice column "Ask Papabear", originally distributed by Furry News Network, has moved to its own site, although it will still be available to FNN for syndication. The greymuzzle's letters of advice cover both traditional and furry-specific topics, including the nature of furry fandom, personal relationships, dealing with adversity, and "coming out" as a furry. Grubss' previous host appears to be on hiatus, having added no content in over a month. 771 pieces (aggregated and original) were posted last year, but submissions declined sharply after July 2011, and slowed to a trickle late least year. Update (17 May): Looks like FNN was listening; several new stories have been published.